The LeBron Watch program that Nike has started will feature special player edition kicks for LeBron that pay homage to the iconic athletes and Nike shoes that have inspired his career. LeBron and Nike are carrying on the LeBron Watch this season with his LeBron 16 kicks. Below is a look at last season’s LeBron Watch kicks the King wore during games. LeBron 15 "Air Zoom Generation"
LeBron has taken it back to 2003 for the first-ever release of the Air Zoom Generation, LeBron's first signature shoe. The Flyknit upper mimics that of the first Air Zoom Generations' white/black/red colorway, with other small details that act as a nod to The King's beginning with Nike. The LeBron 15 "Griffey" iteration inspired by Ken Griffey Jr.’s signature shoes from the ’90s. The shoe is covered in the Seattle Mariners’s colorway of Fresh Water like on the OG Air Griffey Max 1, the sneaker is accented with large white Swooshes on the toe and heel. LeBron’s Dunkman and Griffey’s Swingman logo, a white midsole and black outsole completes the theme altogether. The Miami-inspired teal, pink, and black colorway honors the city where his talents continued to shine. The LeBron 15 “South Beach” reverses time seven years, reimagining one of the most iconic colorways in the King’s signature line. Celebrate greatness on the eve of Air Max Day. Originally imagined by Sergio Lozano, the bold Air Max 95 reinvigorated the Air Max franchise for performance runners. Taking inspiration from the human anatomy, this unapologetic aesthetic expanded the running sneaker’s footprint far beyond its original intent. Now, the LeBron 15 “Air Max 95” arrives infused with the ethos of a ‘90s legend. Originally requested by Phil Knight in 1972, Nike’s signature orange box transformed into an icon that is continually reimagined today. 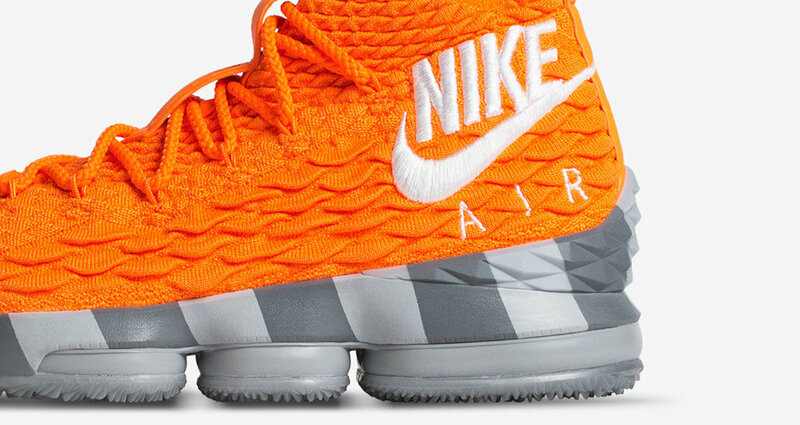 Featuring a vibrant and unmistakable design, the LeBron 15 “Orange Box” pays homage to an unsung hero and the carrier of some of the most influential silhouettes in Nike’s storied history. Introduced in 1991, the Air Mowabb was a cross-training hybrid designed by Tinker Hatfield. Inspired by the Huarache, this ACG silhouette possesses a limitless, pioneering attitude that disrupted boring routines and explored lesser seen paths. From the first time LeBron saw these on his uncle as a kid, the shoe's daring and expressive nature quickly became one of his childhood favorites. Now, this classic is reimagined on the LeBron 15 “Mowabb." Playing two sports in the modern era of professional sports was unthinkable until the 1990s. In 1993, Nike crafted a shoe inspired by the athletes who believed that if you were good enough to play both, you should. With a three-tone colorway and iconic midfoot strap, the LeBron 15 “Diamond Turf” pays homage to the golden era of dual-sport legends that inspired LeBron growing up. LeBron's first pair of special LeBron Watch shoes are inspired by the Nike Waffle Trainer. This look is throwing back to one of the early Nike styles, the Waffle Trainer which was created by the legendary University of Oregon track coach and Nike co-founder Bill Bowerman. The shoe's innovative outsole put Nike on the map as a performance company.